Motorized toys are often hit-or-miss with cats. With our older feline friends, they're usually more miss. Winged Chase is no exception. The toy is well made, with a plastic base that houses the batteries (3 X AA) and the motor that runs the toy. The butterflies are on the end of stiff pieces of wire than can be bent to create different types of movement. We have no problem whatsoever with the design of the toy and its components. In fact, we thought this might be the one motorized toy that would be a hit due to the unique way the butterflies flutter and move. Curiosity was sated and the toy got no more attention. Even days later, when we'd turn it on, no one expressed interest. 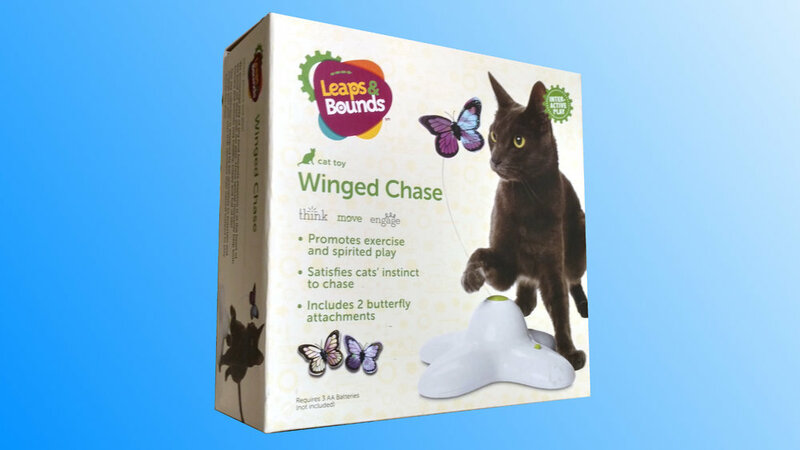 This isn't any indication as to whether or not your cat will enjoy Winged Chase. It could be an instant hit with some cats, particularly kittens. Older cats like ours are more likely to take a been there, done that attitude. The fact is that most cats can identify mechanical patterns quite quickly. They're usually much happier with a human-controlled toy that skips and skitters with random movements. Using a toy you control also means that you get more bonding time with your feline friend. You also get to monitor the condition of the toys so your cat doesn't end up swallowing bits of it when they play. Winged Chase was purchased at Petco on sale for $13.99.